PAWLET—The Pawlet Station restaurant reopened for one special night—“Mexican Monday” —on Monday, Aug. 29, as a fundraiser to benefit the Mettawee School Generator Fund. According to Robert Morlino, who serves as the Pawlet emergency management director, the successful evening raised about $6,300. “This brings us to the halfway mark of our Generator Fund goal,” he said. Morlino noted that 100 percent of the evening’s proceeds—food, beverages, and tips—went towards the fund. There was also a 50/50 raffle, with half benefiting the fund. Tom Kroeber and Stacy Lastrina, the husband and wife team who last ran The Pawlet Station and put on many “Mexican Mondays,” brought the fundraising evening to life with the help of Morlino and his wife Nancy as well as Mark and Margaret McChesney of The Barn Restaurant in Pawlet. 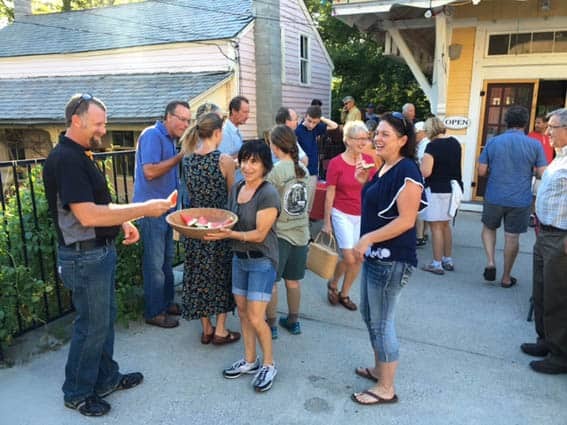 Event volunteer Stacy Lastrina offered “soaked watermelon” to attendees waiting to be seated at Pawlet Station’s “Mexican Monday” fundraiser on Aug. 29.